Lightly wipe 2 baking sheets/pans with 1 tablespoon oil. Cut potatoes into ½ inch strips or leave thicker if you prefer more of a potato wedge. Drain potatoes in a colander then pat dry with paper towels. In a large bowl, mix together all the dry seasonings. Place dried potatoes in the bowl with the seasonings and mix until potatoes are coated. Add the remaining 2 tablespoons oil and mix thoroughly. 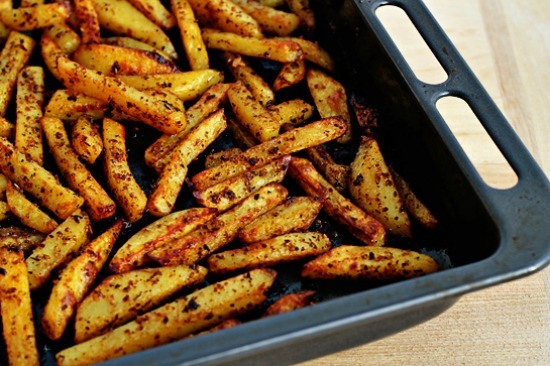 Lay potatoes in a single layer on pans. Leave space between potatoes to allow air to circulate and produce brown crispy potatoes. Bake 15 - 20 minutes, turn and continue baking until crisp and done.